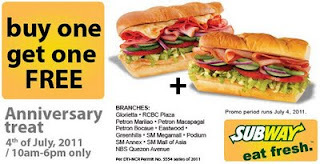 Buy 1 Get 1 FREE at Subway ~ Philippine Freebies, Promos, Contests and MORE! Come and celebrate Subway’s anniversary on July 4, 2011 from 10AM to 6PM and avail of the buy one get one promo. Stop at any participating Subway branches (Glorietta, RCBC Plaza, Petron Marilao, Petron Macapagal, Petron Bocaue, Eastwood, Greenhills, SM Megamall, Podium, SM North Edsa Annex, SM Mall of Asia and National Bookstore Quezon Ave.) and purchase one 6” (15cm) sub with 6625mL (22oz) drink and get another 6” (15 cm) sub with equal or lesser value. This promo is valid for dine-in, take-out and delivery in selected branches only and should not be availed with other Subway promos.